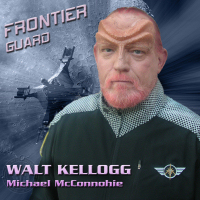 Veteran voice actors MICHAEL McCONNOHIE (TRANSFORMERS, WORLD OF WARCRAFT’S LICH KING) and MELODEE M. SPEVACK (DIGIMON, WORLD OF WARCRAFT) are regulars on the new sci-fi web series FRONTIER GUARD. MICHAEL McCONNOHIE’s extensive credits [IMDb link] include TRANSFORMERS (Tracks, Cosmos, Hotshot, Ironhide), G.I. JOE (Cross Country), VISIONARIES (Ectar, Lexor), THE BIG O, DIGIMON, WORLD OF WARCRAFT (Lich King, Uther), DIABLO II, CRACKDOWN, FINAL FANTASY, PARAWORLD, STAR TREK (games), MONSTER, ARGENTOSOMA, TENCHI MUYO!, BOBOBO-BOBOBOBO, CODE GEASS, ROBOTECH, DRAGON BALL MOVIE 3, STAR WARS ROGUE SQUADRON, POWER RANGERS, TEENAGE MUTANT NINJA TURTLES, HARE + GUU, LENSMAN, VAMPIRE HUNTER D (“D”), NARUTO, BLEACH, FIST OF THE NORTH STAR, TEKNOMAN, ERGO PROXY, PARANOIA AGENT, COWBOY BEBOP, DISGAEA, RUROUNI KENSHIN, BLUE DRAGON, LAST EXILE and many others. 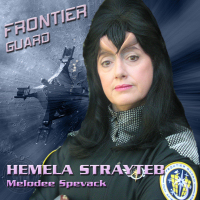 MELODEE M. SPEVACK’s credits [IMDB link] include DIGIMON, WORLD OF WARCRAFT, STAR TREK: ENTERPRISE, MONSTER, ARGENTOSOMA, TENCHI MUYO!, BOBOBO-BOBOBOBO, SAKURA WARS: SO LONG MY LOVE, ROBOTECH, BLEACH, FIST OF THE NORTH STAR, SPACE DOGS, TEKNOMAN, ERGO PROXY, PARANOIA AGENT, COWBOY BEBOP, LOST ODYSSEY, RUROUNI KENSHIN, BLUE DRAGON, DOT HACK, LAST EXILE, MAGIC KNIGHT RAYEARTH and many others. Thanks to Sharon Dean of VoxWorks.com for the press release. This entry was posted on Friday, April 23rd, 2010 at 6:48 PM and is filed under Media: Audio and Videos, Official Sites. You can follow any responses to this entry through the RSS 2.0 feed. Both comments and pings are currently closed.